did you take off the plastic screen protector that came with the unit? Yeah, some cheap screen protectors do that. You will want to take off any bit of plastic on the screen. Install AfterBurner and try fiddling with the LCD/n and LClk/2 settings. Even so, most older LCD screens like that are effected slightly. All my palm V and VX's show it to a certain extent depending on what contrast setting I use. On the one that it looks like Ex-parrot has (SJ20), it has a white backlight that greatly improves visability. But even then, it's no comparison to a colour screen. What do these settings do? Those are syncing and timing settings for the LCD. You can also try the no-streak hack for the hack manager your using to run afterburner. Ive had more sucess with that...i'll try to find it for you as I dont think its published any longer. With afterburner, make sure 0-ws core, fast mpx, and fast page is on at least as this gives an excellent speed bump for free without overclocking the processor. These functions just patch bugs in the palm OS. You will notice a large speed bump in any benchmark program. Just makes the screen flicker Oh well... it doesn't get in the way of actually using the machine. Oh well, sorry about that. 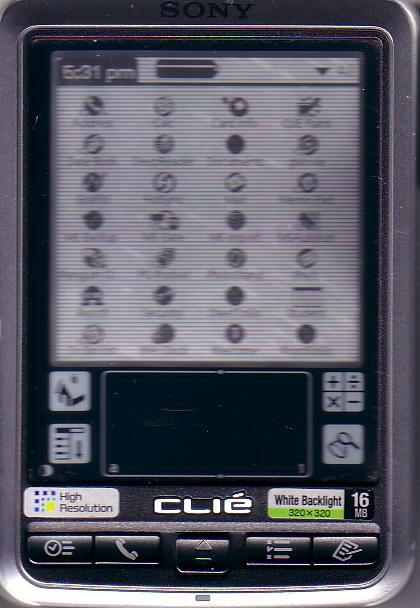 Clie's with the high res black and white screens were mightly odd beasts...i'm not sure how sony managed to get high-res support in palm os 4.